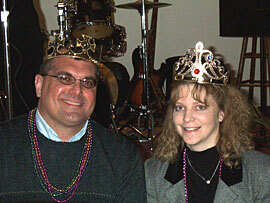 Chris Coyne of State Farm Insurance and Barbie Carter of Logan County Bank were chosen as king and queen of the Lincoln/Logan County Chamber of Commerce’s Mardi Gras-style annual dinner. The group helps build and support business in the community. They've plowed into a new year with the theme of "Planting Seeds for Progress" by adding a new economic development director and a government liaison. Is It time to Give Up on AOL Time Warner?